Caduceus set out to deliver a simple solution to a complex health issue with a new Forge-powered BIM platform product. Since its inception, the easy-to-use platform has effectively helped customers gain exposure to BIM (Building Information Modeling), improving information sharing and streamlining incident prevention planning to ultimately reduce health and safety risks and enhance the lives of building occupants. Asbestos exposure has been identified as a major health and safety issue in the workplace environment. In April 2018, a new law went into effect in New Zealand requiring owners of buildings containing asbestos to have management plans in place to better identify and manage the deadly element. Management plans often require the painstaking testing of different areas, sampling and testing of different elements, removing and/or sealing the asbestos found and documenting it all. The amount of documentation generated by this process can be overwhelming. In one substantial building refit, thousands of asbestos related documents were generated. Management plans and associated documentation are required to be available to anyone working in or occupying a contaminated building, so that occupants are aware of the risks and can learn how to avoid contamination. Building owners previously had no easy way to provide the required access to the relevant information from all their documents in a timely manner. With more than 25 years of industry and BIM knowledge, Caduceus set out to help business owners create more-effective asbestos management plans using Forge technology. How Caduceus solved it with Forge. Capitalizing on Forge APIs, Caduceus developed a hazard management tool that centralizes the storage of BIM documents in a single location and provides visibility of essential data contained in these documents via an interactive and easy-to-use interface. Caduceus uses the Model Derivative API to translate design files for 3D viewing in the Forge Viewer. With use of the Data Management API, the cumbersome documents can be easily stored and linked to the building model in one central cloud location. Customers using this new tool, such as Argosy Property Ltd. in New Zealand, can now quickly extract the relevant building information to troubleshoot asbestos in specific building areas. This allows customers to facilitate maintenance workflows, as well as create preventative plans of action, all within a much shorter time frame. 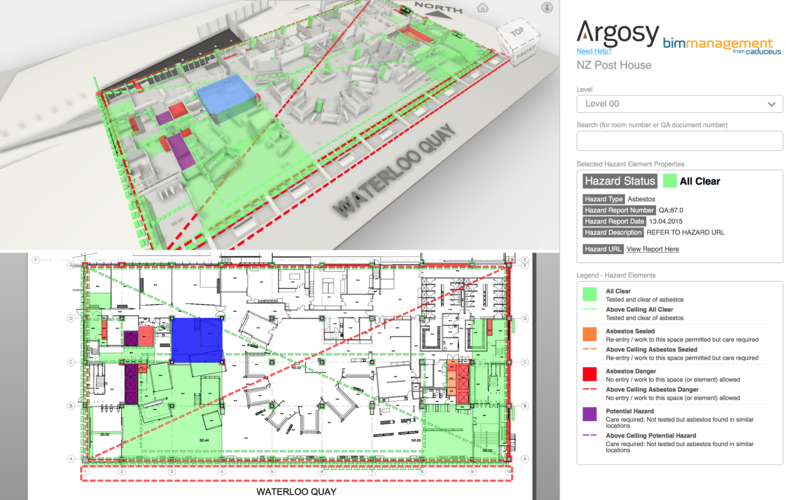 In fact, for Argosy Property Ltd., the time between pinpointing issues on the 3D platform and conducting issue resolution on the corresponding physical buildings has dropped from up to an hour to a matter of minutes, all with a significantly lower rate of human error in the process. The hazard management tool has decreased building managers’ issue resolution time from up to 60 minutes to 2-3 minutes. The entry barrier into BIM software for many New Zealand customers has lowered, as the new hazard management tool is both cost effective and easy to implement. The platform-based solution is easily and rapidly scalable, as well as personalized for additional customers, creating new business opportunities for Caduceus. "Forge provided BIM exposure to those customers who might be intimidated by, and would otherwise never use, this new technology."